Size: approx. 8 mm. Photo: 08/17/11, 9 am. 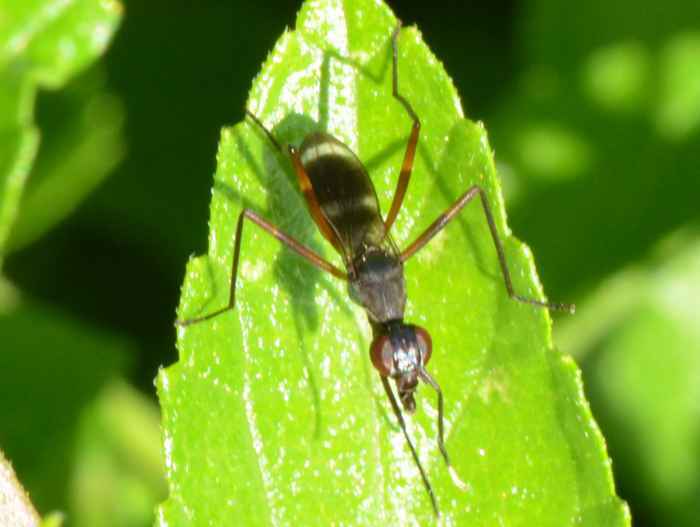 This Stilt-Legged Fly (Taeniaptera trivittata) looks and acts very much like an ant. It holds the front legs up like long antennae to distract from its short fly antennae. It was dashing over the leaves and difficult to photograph. The wings remind me of a wasp. The tips of the front legs are white. The genus has three species in the Southern states. The small photos show other stages.